Home Normal Weight Nutrition (what you eat) Sugar: How Much Is Too Much? This is Part 2 in a 4-part series on Sugar and Other Sweeteners. In Part 1 of this series, I described how sugar is implicated in a wide range of illnesses, from heart disease to cancer, as well as causing obesity. Many scientists researching the relationship between sugar and disease have stopped eating sugar as a result of their findings. But is it necessary for health to stop completely? And is it necessary to eat for health? Sugar does pose a serious threat. But just because a food is unhealthy doesn’t mean you shouldn’t eat it, or that it’s wrong or bad to eat it. What you eat is not a moral issue, there are other considerations besides health, and it’s your life. There’s a big fallacy in the non-diet world that there are “no bad foods” and that is why you can eat all foods. I say something very different: There are bad foods, but you are still entitled to eat whatever you want – just do it with your eyes open. If you deny that some foods are bad for your health, then you can’t take responsibility for your choices. The purpose of this article is not to tell you what you "should" eat. It’s to give you information that you can use as input for your own decision. As I mentioned in Part 1, one of the diseases that sugar exacerbates, if not causes, is cancer. Researchers believe that as many as 80% of human cancers are driven by elevated insulin levels. Until the 1700s, sugar was a luxury and very expensive, so only the wealthy ate it, and even they ate it rarely. During the 1700s, sugar started to become popular. The price of sugar initially dropped due to slavery in the Carribbean, and then dropped more during the industrial revolution as sugar production became increasingly mechanized. By the mid-1800s, per capita consumption had skyrocketed in urban areas. Sugar was considered a necessity and a staple of the Western diet. Something else started happening in urban areas of Europe in the mid-1800s, especially France and England: Cancer rates started rising. The increase was dramatic enough to prompt a survey of cancer rates worldwide to discover the cause. Data from remote locations came from missionaries. If you want to see why they were so upset, take a look at these very graphic photos from the 1800s (don’t look if you’re squeamish – medicine was still quite primitive back then). The researchers discovered that cancer – plus a cluster of other diseases – was extremely rare in isolated populations eating traditional diets. But when these populations started eating a Western diet, all those previously unknown “diseases of civilization” started to emerge: cancer, cardiovascular disease, obesity, dental cavities, periodontal disease, appendicitis, varicose veins, hemorrhoids, and constipation. 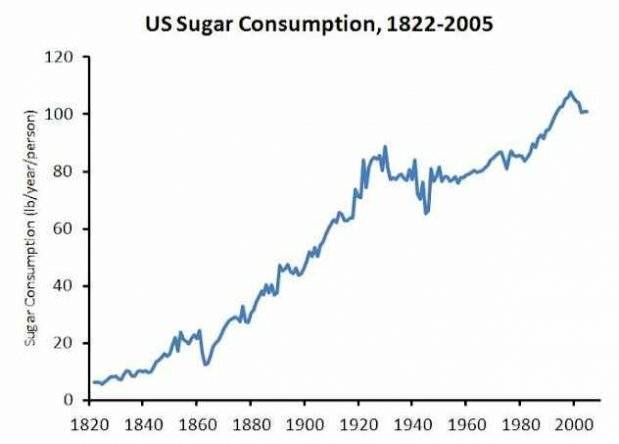 It would be instructive to know exactly how much sugar Europeans were eating in the mid-1800s, since it was apparently just past the threshold of what causes disease. In England, it was about 36 pounds per year. 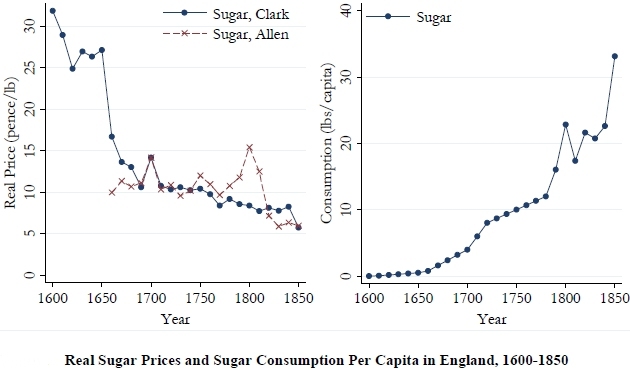 Here’s a graph showing sugar prices and consumption in England from 1600-1850. Stephan Guyenet, who compiled these numbers, writes: "It’s a remarkably straight line, increasing steadily from 6.3 pounds per person per year in 1822 to a maximum of 107.7 lb/person/year in 1999. Wrap your brain around this: in 1822, we ate the amount of added sugar in one 12 ounce can of soda every five days, while today we eat that much sugar every seven hours." Just based on this epidemiological data, we should be eating under 30 pounds of sugar per year, and that is not very much sugar. There are 1760 calories in a pound of sugar. If you eat 30 pounds in a year, that means 145 calories of added sugar per day – less than the calories in one can of soda. In the 1970s, there was a debate over whether heart disease was caused by sugar in the diet or saturated fat, with John Yudkin leading the argument for sugar and Ancel Keys leading the argument for fat. Ancel Keys won on political grounds, but he was wrong. Since then, many scientists have found fault with Keys’ methods, countless studies have confirmed the relationship between heart disease and sugar, and in 2009 the American Heart Association (AHA) issued its first ever guideline for added sugar intake. It turns out that 145 calories of added sugar per day is remarkably close to the AHA recommendation, though they arrive at the number differently. The AHA recommends a maximum of 150 calories per day in added sugar for men and 100 calories per day for women – half the discretionary calorie allowance, according to 2005 US Dietary Guidelines. You may be wondering if it’s really necessary to cut back this much. Kimber Stanhope, one of the researchers interviewed in the 60 Minutes story on sugar toxicity, wondered, too. She studies the effect of fructose on triglycerides and LDL cholesterol, two risk factors for cardiovascular disease. 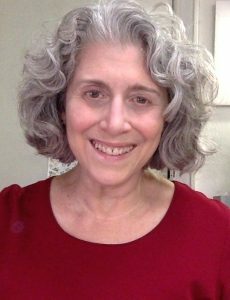 In a study published August 17, 2011 in the Journal of Clinical Endocrinology and Metabolism, she tested the new stringent guideline against the Dietary Guidelines for Americans from 2010, which says sugar can safely be a maximum of 25% of energy requirements (calories). Figuring out how to follow the AHA recommendation is tricky. Added sugar is in almost every processed and prepared food – not just sweet beverages and desserts. In 1972, when John Yudkin wrote Sweet and Dangerous, the proportion of sugar eaten in the US that came from manufactured foods was "more than 70%", up from 50% in 1957. I don’t know how he found this number, but it’s probably even higher now. Sugar is in mayonnaise, peanut butter, and bread. Virtually all canned, frozen, packaged, processed, and convenience foods contains sugar. If you eat a lot of these foods, even without sweetened beverages, juice, or sweets, you probably eat significant sugar. Drink water, seltzer, or unsweetened herbal tea if you’re thirsty. Avoid soda, juice, and sports drinks. Also remember that alcohol is sugar. Sugar in liquid form is most harmful because it hits the liver quickest. Read the label of every packaged food you buy, and avoid brands with added sugar. You can find peanut butter without added sugar if you look. Eat less processed and convenience foods – cook at home more. For example, virtually all store-bought mayonnaise and bread contain sugar, but these are easy to make at home, and taste better, too. Think of dessert as something you eat once in a while rather than every day. How often? This is probably not the only added sugar you’re eating, so overestimate the sugar calories by assuming that all the carbohydrate calories are from sugar. If you’re a woman and the dessert contains 300 calories from carbohydrates, figure you’re eating three days worth of sugar. Don’t use artificial sweeteners. 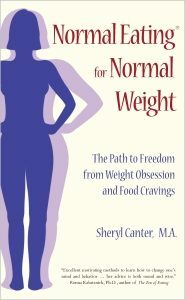 They cause obesity in a different way, as you’ll see in Part 3 of this series. If you’re currently eating sugar once a day or more, you may be physically addicted. Once the physical addiction is broken, it won’t seem so impossible to cut down. I’ll address this in Part 4. Don’t let the perfect be the enemy of the good. If you’re eating less sugar than you were, you are still better off. It’s not like you can never taste sweetness again. Fruit is delicious! It’s your right to continue eating sugar as you have been, but doing so should mean you accept the risks to health and weight, not that you are denying these risks. Not every food decision is made on the basis of health and what will extend life – or should be. Not every life decision is made on the basis of what will extend life. Quality of life matters, too. If all we cared about was living as long as possible, we’d live in a sterile bubble and never get in a car or do anything. People take risks to make life worth living. You may decide that eating some amount of sugar is worth the risk. Or you may decide it’s not worth the risk. Either way, these are the facts. The decision is up to you. I thought I could never stop eating sugar. I struggled with my weight for so long, and nothing I did seemed to work. I tried every “diet” known to man, with little or no success. The weight just stubbornly stayed on. About 3 months ago I was told that if I didn’t change my eating habits I would end up with Type II Diabetes, which can lead to many other health issues. It really woke me up and I did a test online called the ‘nutritional typing’ test. It tells you what type of foods work best with your body type. I am a veggie type. As a result I have changed my entire way of eating. The first two weeks were the hardest, because I was seriously addicted to sugar, so I had to tough it out, but after that it was easier. That was three months ago and I have lost 21 pounds. It seems so easy. I am not dieting. I have changed my way of eating. I occasionally will have a treat, such as an ice cream cone, but very occasionally. I enjoy the treat so much more, because I am not eating it all the time. I feel better and certainly feel better because I am finally getting the excess weight off. I do eat fruit, only fresh, and not an extreme amount. And you are right, it is delicious when you haven’t been eating sugar. The fact that alcohol is sugar just hit me. I have a drink a day – and that is close the limit on added sugar. And I have one sweet every day. But I also maintaining my weight and eating normally. Somehow, though, I think the drink and the sweet are not great substitutes for better calories. Something to ponder. I only started cutting out sugar a week ago and already I feel so much better. I have more energy, feel fuller on less food and fewer headaches. I am so excited to the long term benefits! Thank you so much for your article. Great information I think everyone should know. I just want to say that this isn’t about cutting out sugar necessarily – though you can if you want – just eating much less of it. There’s a tipping point with sugar where once you start eating too much of it you start craving it. That’s the subject of Part 4. When you eat less sugar, you want it less. I’m really looking forward to parts 3 & 4. Will they be posted soon? Glad to hear it! I’ll probably be posting Part 3 either late today or tomorrow. Part 4 is scheduled for early/mid August. Interesting articles! I wonder if it is of any benefit to think of the balance of foods one might be consuming with sugar, for example mixing nuts, ground flax seed etc in with sweetened yogurt. Going sugar free being preferable of course, but I know for me it would be one restriction too many at present. So it seems fiber and other foods eaten with the sugar would lower the insulin spike and mitigate some of the damage until my stage 4ness could handle improvement. Robert Lustig says that eating fiber with sugar is the key, and that’s why whole fruit is fine but fruit juice is as bad for you as sugared soda. 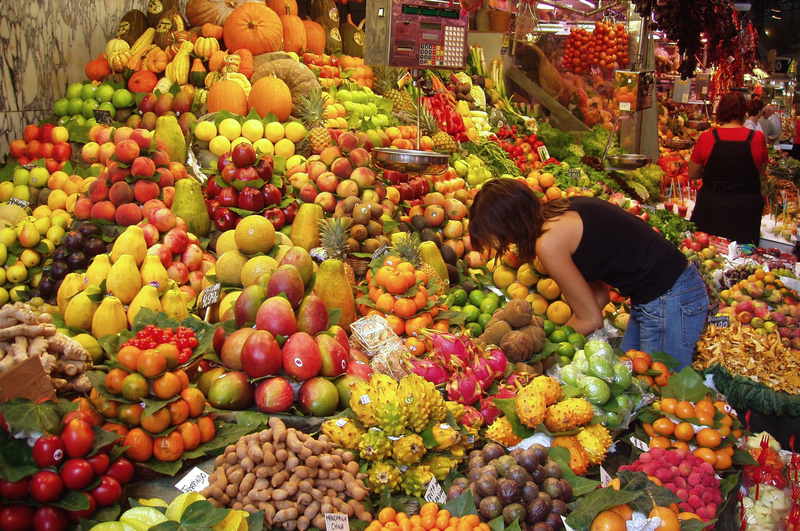 The fiber in the whole fruit slows digestion. I talk about this in Part 1. So yes, eating sweetened yogurt with something high fiber like ground flax seeds or nuts would reduce the risk and be better for your health. That said… I used to eat yogurt, fruit, and walnuts with a little honey dribbled on top as a meal quite often (sometimes for breakfast, sometimes lunch, sometimes dinner). After writing these articles, I stopped putting honey on it. I thought I’d really miss the honey, but I don’t. The fruit is sweet enough. I also stopped putting sugar in cornbread when I make it, and I discovered that this allows me to really taste the corn, and I enjoy it. I was mainly tasting the “sweet” before – the cornbread had been just a vehicle for “sweet”. I started experimenting with making bread, too, since the bread you can buy all contains sugar. At the time I still had some honey (all gone now), so after making some loaves without any sweetener, I made a loaf with a little honey and discovered (to my surprise) that I actually preferred the bread without honey or sweetener. I realized that I’ve been masking the taste of virtually everything I eat with sweeteners. I discovered that I actually like other tastes besides “sweet”, and like being able to taste them, unmasked by sweeteners. I didn’t expect that. Thank you very much. It has been a great advise, since I have a heart problem, but I didn’t relate it to my love for sugar. I will start eliminating it, especially daily desserts, chocolate, frosting and candy. As I said in the blog post, sugar eaten as part of a whole food, like an apple, contains fiber to slow its absorption, so it’s not a problem. Fruit juice is a different matter. That is like drinking a sugared soda because the fiber is what’s removed when you juice. Sugar is the one food I must avoid. I can use natural sugars such as honey or maple syrup in moderation without getting the urge to binge. And lots of fruit of course. Drinking in moderation is ok for me. Chemically, there is no significant difference between white sugar and honey or maple syrup. I discuss this in detail in the first article in the series. If you respond differently to them, it is because of how you think about them, not a difference in the food itself. Thank you for your info on sugar. It really helped me,now I am living a better life because of it!! !